Milwaukee's streetcar is expected to open to the public in November. Do you know how to share the roads with the streetcar system? 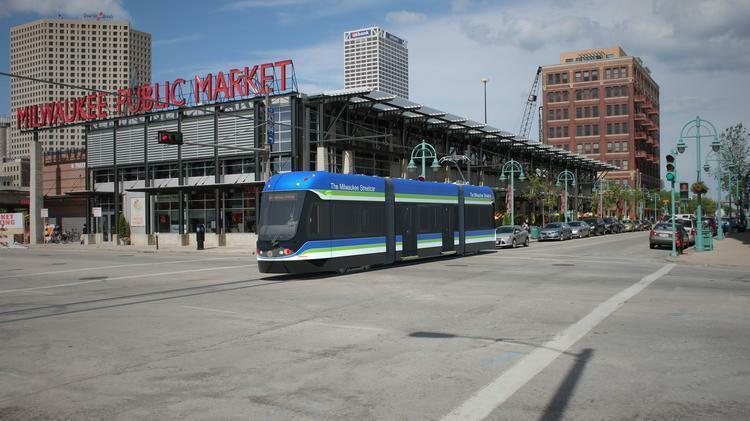 WUWM's Marti Mikkelson reports on Milwaukee's streetcar, The Hop. If you’ve been traveling in downtown Milwaukee recently, you may have noticed crews conducting test runs on the streetcar. With the streetcar’s initial 2-mile route opening Nov. 2, some people have safety concerns. Several cyclists reported injuries and have filed claims with the city of Milwaukee after their tires got wedged in streetcar tracks. Some are wondering whether streetcars, motor vehicles, bicyclists and pedestrians will be able to coexist. The Milwaukee streetcar, which is called The Hop, travels on N. Broadway during a September test run. The city will operate five streetcars along the 2-mile stretch. It connects downtown to the lower east side, and extensions are planned for the future. McKayla Campbell lives near the route and worries about accidents once the streetcar begins operation. “I do have a safety concern with bikes because I know there is already a bike problem in Milwaukee with people getting hit, and I think the trolley will add an extra distraction for drivers,” Campbell says. 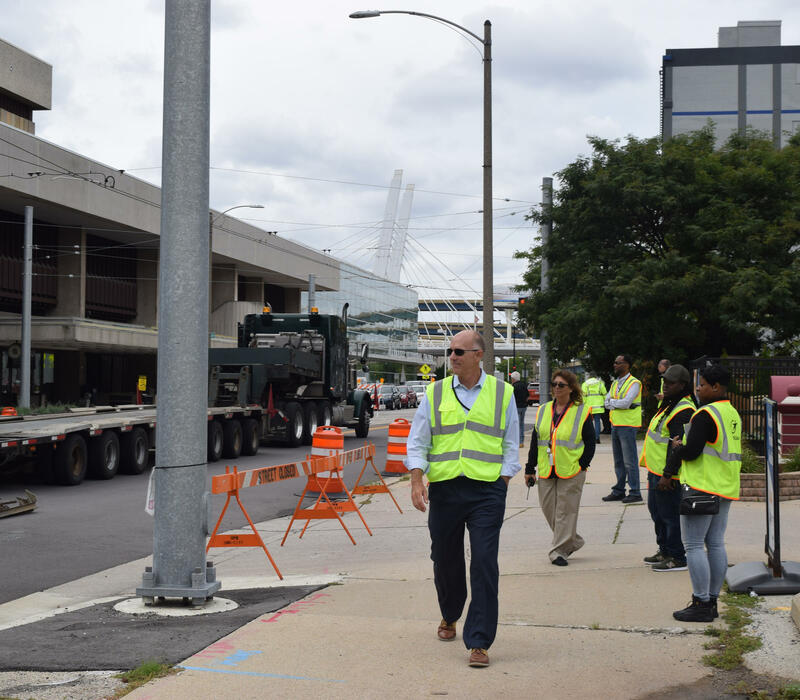 Dozens of people gathered on W. St. Paul Avenue recently, watching as a huge flatbed delivered the fifth and final streetcar into downtown Milwaukee. The truck parked near the streetcar’s maintenance facility. Then, workers used giant wrenches to unscrew the bolts that were holding the car onto the bed. WUWM's Marti Mikkelson chats with Lake Effect about Milwaukee's streetcar. A worker removes the fifth and final streetcar from a flatbed truck on Sept. 7. Mayor Tom Barrett was among the people celebrating the car’s arrival. He acknowledges it will take some time for everyone to get used to the system. “We think it’s going to be a change, but it’s a change that people will become accustomed to. The tracks are there, cars can drive over these tracks. Obviously, we’ve had a few issues with bicyclists or motorcyclists,” Barrett says. City Engineer Jeff Polenske (center) observes the delivery of the fifth and final streetcar on Sept. 7. He advises bicyclists who need to cross the tracks, to approach them at a 90-degree angle, instead of traveling alongside them. 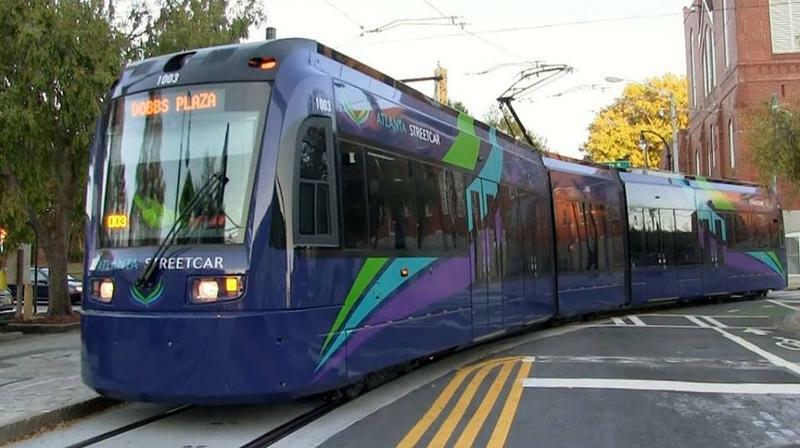 City Engineer Jeff Polenske says a public education effort is underway to make sure that people understand what to do when traveling in the vicinity of a streetcar. “The rules of the road are essentially the same. 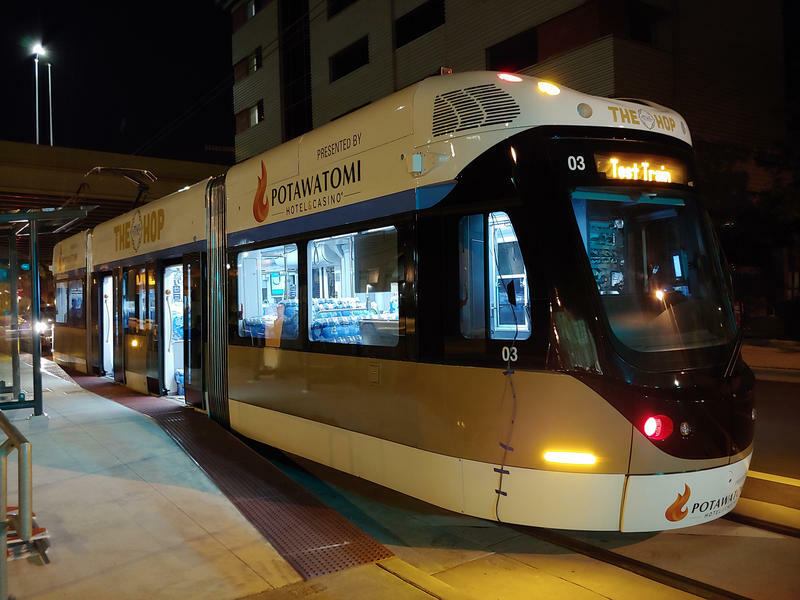 There are some unique scenarios that not only the streetcar will be encountering to operate within the downtown but also motorists," Polenske says. 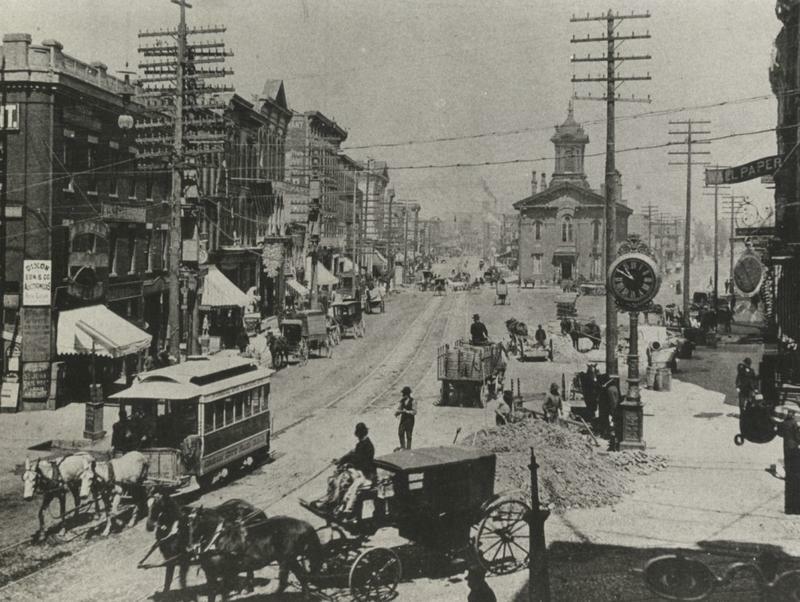 "There are some locations where there are exclusive lanes to the streetcar. 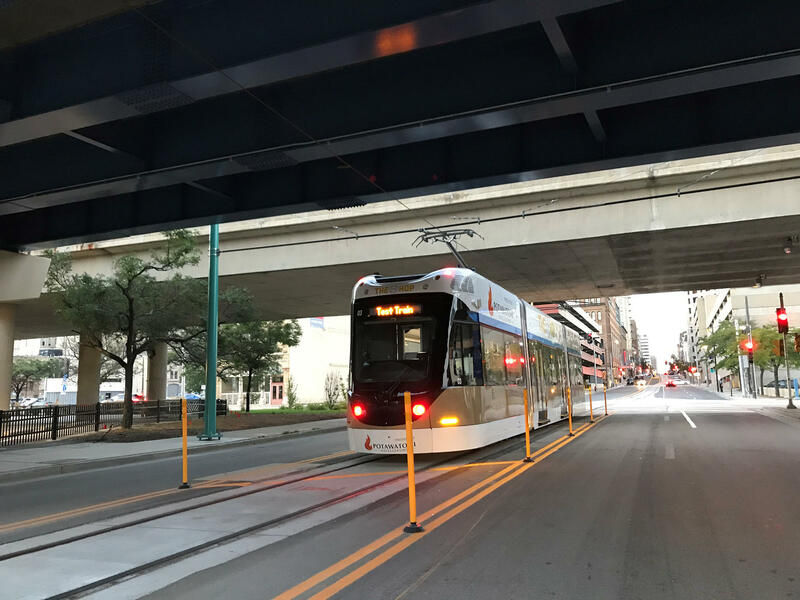 In those locations, motorists will see some unique signage that will indicate to not follow the streetcar into those lanes." Signs with that message have sprung up near Cathedral Square on Kilbourn Avenue and at Burns Commons where the streetcar stops at the end of the route. The streetcar’s website has safety tips for motorists, bicyclists and pedestrians. Polenske says the city plans to step up its education efforts, including on social media, in the coming weeks. 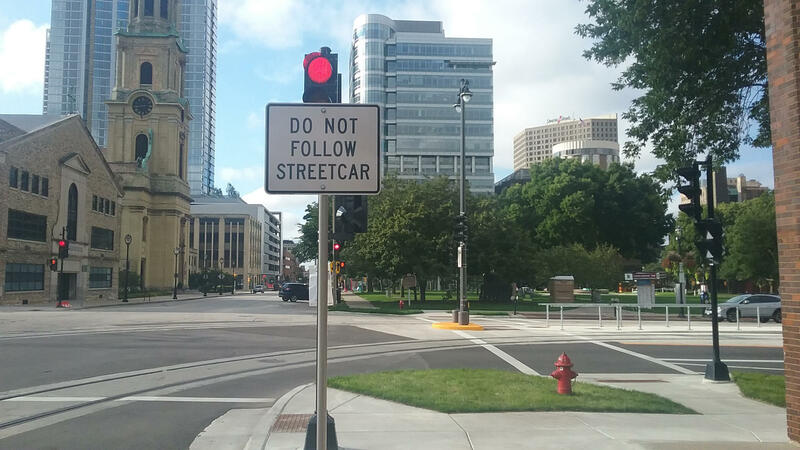 "Do Not Follow Streetcar" signs mean the streetcar will be going into a streecar-only lane. But, Ald. Mark Borkowski isn’t convinced things will go smoothly once the streetcar starts up in November. Borkowski is vice chair of the Public Works committee and has been an outspoken critic of the project. He says besides traffic flow, he has other safety concerns. “We’re going to have issues when the weather is very severe, be it an ice storm, be it 10, 12, 14 inches of snow. You not only have the rail lines, but you also have the wires above,” Borkowski says. Borkowski says he plans on holding city leaders’ feet to the fire. He says he’ll request that members of the Department of Public Works appear before his committee to answer specific questions about safety before the streetcar service starts in November.